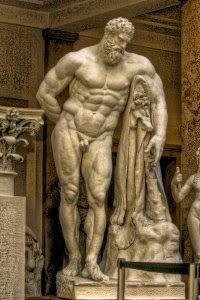 STRENGTH AND THE CITY: Hey Man.. Can you gimme some tips? Hey Man.. Can you gimme some tips? I recently moved into a new office, made a bunch of awesome new friends and had a great time high-fiving in between intense bouts of work(or pretending to do so). It's always a great idea to keep adding to the list of people you mutually know, in order to just mi up things a bit and bring some new spice into life whenever in doubt. "I was wondering if you can give me some ideas about making a good physique/body?" "I just need my Bicep-vein to pop up"
"I only need this pinch of tummy to vanish"
"Oh, this part of my shoulder... just get this big somehow." 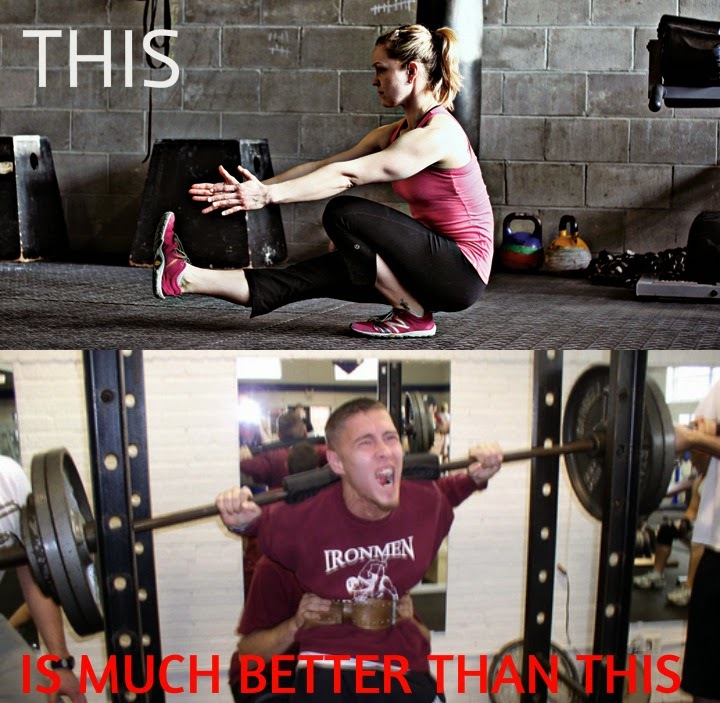 A heavy barbell squat with plates overflowing from both ends, only to move the heavy iron about a Kajillionth of a centimeter(ouch, before my sweet leggies move out of their comfortable couches) can do your leg development way less than what a perfectly executed bodyweight squat can. Or if bodyweight squats are too featherweight for you, let's say, the one legged squat variations. This is not to say that heavy weight training is not the best way to get strong and in shape fast for both men and women. The point being driven home here is to understand the importance of basic movements(The Push, Pull, Hinge, Squat and Loaded Carries, as Coach Dan John might call it) and start mastering the very primitive, often unloaded movements before moving on to adding any weight to it. The path may be longer than what most of us feel, but very well delivering in terms of the fitness based values it develops in the grand scheme of things. I've fallen to that trap too for years. All through my years of beginning in the Iron game, much of my vision(if I did have any) was centered around NOW, compared to years from now. Fast forward today, I can see I wasn't alone in thinking so. As much as the fortnight long gym membership of several members of the commercial gyms lining the country might convey, we have lost touch of the bigger picture with time. Pick up an activity and keep performing it, even with sub-optimal progress,for a considerable amount of time. In the long haul, consistency is way more important than intensity. Ironically, it is actually impossible to understand the merit of what years of sustained good(not necessarily hard) training can achieve compared to a few weeks of eventually ending hard training. It took a very long time, consisting of several thought changing moments to understand that progress may not always be visible from session to session on a daily basis, and that's still a good thing. I remember myself lifting the same amount of weight on my Squat week after week after week, only to finally one day, 'feel it easy' enough to put another Nickel(a cool way of saying, a 5 pound plate) on either side. Now we all do have our rates of progress but sooner or later we all hit across such strength and performance plateaus where a perseverance strategy like this is the only way out. The strategy can be applied to any big movement: Deadlifts (especially), Bench Press, Military Presses, Pull Ups etc. It's a relatively longer process than what many of us believe and the most nagging part is that looking from an external lens, many of us new to lifting may never even be able to realize the amount of time it requires. Pick up an activity and keep performing it, even with sub-optimal progress,for a considerable amount of time. In the long haul, consistency is way more important than intensity. 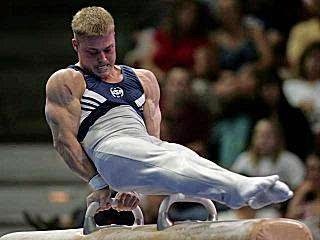 Gymnasts are known for gaining exceptional physiques merely by years of perfect execution of their sport alone. Ever wondered how some automobiles appear better than others? This may often have to do with the way the principles of design have been followed and adhered to while drafting a blueprint for the car. Evidently, several artists of the historic ages have been cognizant of the design principles of Balance, Proportion, rhtythm, unity and emphasis while making their masterpieces depicting the human body. Be it the remarkably beautiful human shapes of Khajuraho or the supremely built statues of Greek Gods, somehow the genius sculptors realized that these epic proportions have prime health and happiness benefits attached to them. In other words, if you try to follow proportion and balance while developing your body, you may often end up gaining superior health benefits, compared to someone who is biased in developing his or her physical aesthetics. And the number one ignored body part is the one which demands the most amount of mental tolerance and labor: The Legs. Train your legs and you can reap the untapped health and body composition benefits from your training owing to the very high energy requirements of such a taxing workout. Evidences have also proven that training the legs is anabolic in the ways in which it can help put on quality mass on the rest of your body as well. In other words, train your arms, and you may get bigger arms; train your legs and you may get a bigger body. 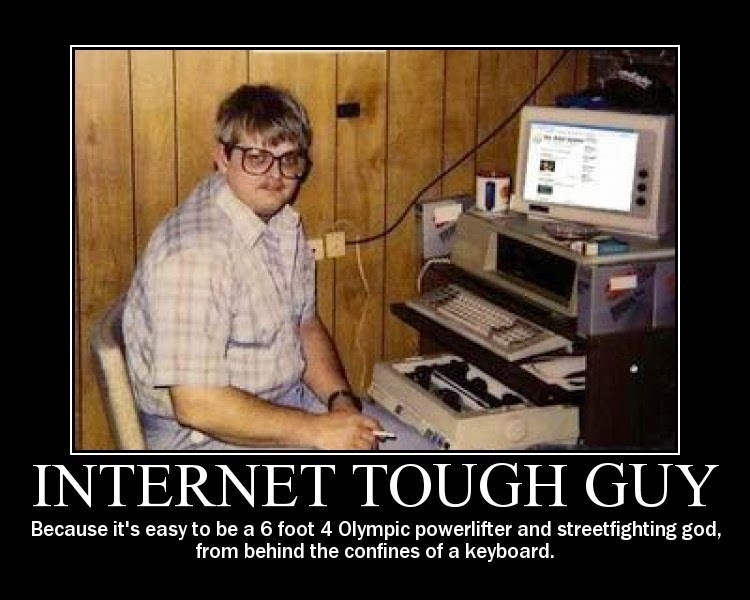 A tonne of reading the cutting edge literature on strength and conditioning may never deliver its benefits to a keyboard warrior never lifting a dumbbell heavier than 7.5 pounds. 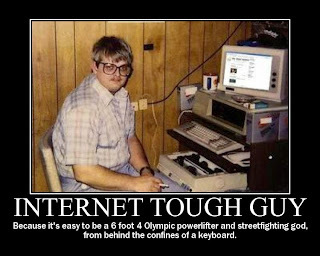 We all at some point during our training career encounter the tribe of Internet educated, jargon sporting pseudo strongmen overflowing with advices about how to employ an underground exercise they learned which can help bring out the horseshoe of your triceps. Only minutes later, utter humiliation might result when you need to rush to save the poor soul from being crushed under the smith machine bar loaded with ten pounders each side. Application requires solid effort on our part and many of us may be taken aback sometimes by how much effort following the program we studied last night on the internet requires when actually done following each and every training parameter to the T. This should not mean that reading and staying on top of the latest trends in the science of lifting and strengthening isn't important. While we should all strive towards enriching our knowledge and understanding of the game, learning from the veterans of this sport, applying all the acquired knowledge on the gym floor, the lifting platform or the exercise mat may only enhance our value as a champion and sometimes give us eye-opening lessons and reality checks. Taking a page out of my own experiences with lifting, I must say, I have learned more from the later years where I thrived towards improving my techniques, testing my form and constantly aimed at taking calculated risks in the weights I lifted. 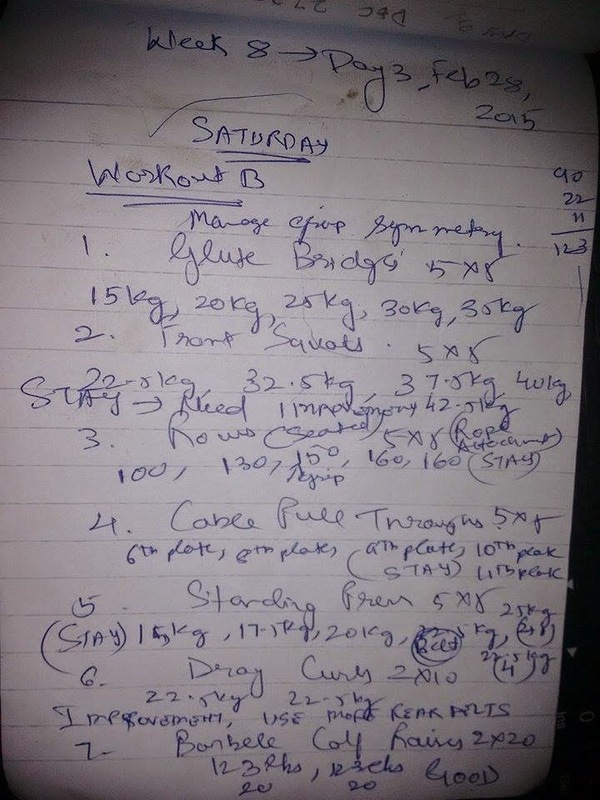 The invaluable feedback I collected from my training logs(more on this shortly) was as I discovered the most useful form of education I could ever get towards getting stronger and becoming a better lifter. Following the previous point, writing and maintaining a training journal can be a real tedious task. In between enigmas of sweaty rounds of heavy squatting, the last thing your recovering mind would love to do is to record the amount of weight you just lifted and turn into a mini-philosopher while trying to write down how you felt doing those last two reps. Lifting weights is a progressive endeavor, requiring at all points whether you are progressing in a particular performance area or not. Actual Log Entry from a training session I did. Of course I am awarded for the worst hand writing in the world. Throughout the gyms I have been training in, I am (in)famous as the guy with the diary in his hands. That's what my fellow lifters call me looking at the immaculate logging I do throughout my training sessions. Unfortunately, this also tells how maintaining a journal is not a very widespread practice in the gyms throughout the country. Incorporate this small change in your lifestyle and you may never be dissatisfied by the amount of progress you start making. Well, pheww.... that was really exhausting, trying to write about the top five improvement areas I would love everyone to include in their training vision. I can only imagine how hard would it have been to explain this to my office buddy in about 3 minutes. The insights behind these ideas spring from countless failures and epic mistakes I have been doing throughout a span of a decade learning about lifting. As always, it's still incomplete without the Golden feedback of yours. So hit the comments section and get your thoughts pouring out on the subject. I will go and get back to work now at my desk. That Fit Body: A journey and not a destination!